Books and reading are my passion which I’d like to share with others. But this said, I also enjoy writing about just about everything else – for example Tarot, Mahjongg, cooking, social issues, current events, politics, a travelogue or maybe a piece of my flash fiction or short fiction; Occasionally my cat, Chocolat, adds a short bulletin about what’s going on in our lives. Why the Timbuktu title ? This African city was once a centre for learning, scholarship, and books. But I live way, way further south than the fabled city. I’m writing from a Southern African perspective. I live in one of the most beautiful cities in the world : Cape Town. Please leave comments –I enjoy interacting with my readers. We hope you enjoy the attention it brings you and that you’ll pass it on. Gosh! Thank you! I looked at your link and am a bit overwhelmed by the 11 Qs etc. etc. but will do my bnest. Plus there is now the dilemma of the pass-on. Okay. Will get to it. It certainly is a good way to discover new blogs and make new friends. Alison, would you be interested in doing a guest post on my site to give a. Insight on literature from South Africa? Thanks for the offer. Yes – provided you are not in a hurry for it. When would you like it and how many words? As for the timing, would it be possible by the end of February? Hello Allison, discovered your blog this evening through your comment on “Cats and Chocolate”. Was wondering if I could write to you in Afrikaans, but it doesn’t look likely, since you grew up in Rhodesia. Anyhow, aangename kennis! Hello Tannie Frannie – aangename kennis to you too! sorry – English is my taal. My Afrikaans is poor – rapid, and poor. I have comprehension but fluency not so good. P,S, my name is spelled with one ‘l’. Ek hoop ons gaan nog lekker kuier hier op die blogs. 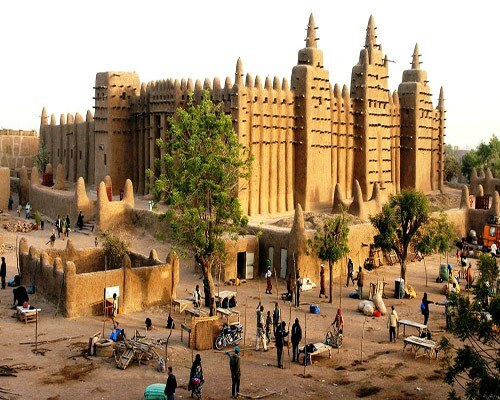 Thank you very much for this site… It reminds us about a more recent glory times in Africa-the City of Timbuktu. Africa–i’m confused. thot you were living MUCH farther north. Hello Travelling Penguin – thanks for the blog follows. Will pop into yours once I’ve caught up with the mountain of mail lurking on my PC after my Christmas away break with the family.